Up to 1989, McCartney was the movie's bad guy. It was him who dared to survive and age with grace, while his colaborator John Lennon achieved immortality one tragic monday of December, 1980. It was him who kept working on that dreadful night. But he also had the bad luck of having made two pretty lame albums after a top masterpice like Tug Of War (1982) and signing a Faustian deal with Michael Jackson to record a couple of duets ("Say Say Say" and "The Girl Is Mine") and making him getting the publishing rights of the Beatles songs. Damn, the eighties were bad for Macca! Pipes Of Peace? Press To Play? Shameful albums. But 1989 came and McCartney surprised us fans with a heavy-Beatle-influenced and inspired collection of songs. Maybe inspired by the 20th Anniversary of Pepper and the Summer Of Love, who knows, who cares. It was a delight seeing him coming out of the shadows of the lame with Flowers In The Dirt. The album is now a snapshot of a transition moment in Western history and, of course, it's timeless by itself. A tribute to the dawn of the Age of Aquarius, the idealism of the hippies and the melancholy of looking back at how things developed. It seems the flowers that decorated compulsively the cover of Sgt. Pepper were stomped on the ground by people like Khomeni, Tatcher, Reagan, The National Front and, particulary, a Beatle-obsessed fat guy who carried a copy of Lennon's Double Fantasy LP and the J.D. Salinger book The Catcher On The Rye. Mark David Chapman killed the flowers, but McCartney remembers them with love, passion and a beautiful album cover too. Vivid red and orange colors surrounding decaying flowers that still remain appealing, even abandoned on the ground. Once the album starts playing, we get the first of several surprises: "My Brave Face," a fresh and clean electric guitar driven song recalling the same guitar played by Paul 23 years earlier, opening Revolver with "Taxman." To write and produce songs like this one and "You Want Her Too," Paul needed a collaborator with a similar wit and tongue-and-cheek attitude as John Lennon's. He invited Elvis Costello and together wrote, besides these two, beautiful songs like "Don't Be Careless Love" and "That Day Is Done." Pink Floyd's David Gilmour plays the haunting solo of "We Got Married," and by the time Paul shows us "Put It There," an acoustic folk tune about his father's old saying, we find ourselves immersed in an outstanding listening session. His wife Linda's there, too, bringing the Wings background vocals and keys that put McCartney's band as one of the best selling acts of the mid seventies. McCartney, at the beginning of the nineties, was news. Peruvian magazine Caretas published an excerpt of an interview in which McCartney came clean about his relationship with John. And guess what? He would visit South America for the very first time in 1990, packing the Maracana Stadium at maximum capacity. Only a Beatle, Sinatra and Pelé could have done it, for sure. Nothing would be as magical and nostalgic and good as Flowers In The Dirt and that amazing World Tour. You know the story: The death of Linda, his marriage to Heather Mills, his lowest career point singing "Freedom" at the Super Bowl half time, and his partial recovery with Chaos And Creation In The Backyard. Well, we can talk about these stories later. In the meantime, let's enjoy McCartney's comeback, 20 years ago. Javier, a great album and a great comeback by one of the most influential songwriter and composer of the 20th century. 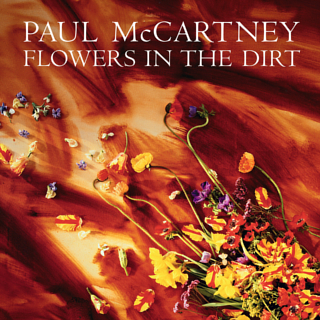 Paul McCartney has to face a new period at the end of the eighties and what a great return with Flowers In The Dirt. My personal favourites are: Put It There, My Brave Face, Distractions and This One but the whole album is good. The eighties for Paul has some good and bad moments as I said this is a new beginning with a new band. Paul embarked in a sucessful tour 1989 -1990 to promote his new album. This period album tour (1992-1993) will continue with the album Off The Ground.